is identified with the string perturbative vacuum in the Superstring Theory as sketched qualitatively in Figure 02-18. The models are constructed with a framework where the universe can be represented as a wave (the Wheeler-DeWitt wave function) propagating in an abstract, multidimensional space dubbed superspace (no connection with super-symmetry). The string perturbative vacuum is characterized by a nearly flat space-time geometry and the vanishingly small coupling of all interactions. Figure 02-19 shows the evolution of the curvature (represented by the Hubble parameter H) and the gravitational constant G (determined by the dilaton). Figure 02-18(a) is a schematic diagram to portray the transition as a quantum mechanical reflection of the wave function in a mini-superspace whose coordinates correspond to the dilation and to the spatial radius of the universe. The dilaton is a neutral scalar force field (or particle) associated with the duality transformation for the spatial radius (of the universe) R 1/R. The incident wave describes the initial evolution of the universe from the string perturbative vacuum towards the high curvature regime. Part of this incoming wave is not stopped by the barrier and is classically transmitted to the region of ever increasing dilaton, running towards the singularity. Another part is reflected to the region of decreasing dilaton and standard post-big bang evolution. This process is not very efficient as shown in Figure 02-17(c). The more efficient one is the "anti-tunneling" effect of the wave function, i.e., as the creation of pairs of universes from the string perturbative vacuum. The wave function is amplified during this process as shown in Figure 02-18(b). See a "Toy Model" by Quantization of the Friedmann Equation. and the nodes become quantized units of volume. A crucial difference in such formulation is that the lattice is not fixed, it evolves according to some rules. Thus, space-time is not a background scaffold anymore. Its application to cosmology reveals that the universe evolved from a pre-existing state toward very high density in a very small volume but then bounced back because repulsion is generated at such high density in LQG. It led to a "super-inflation" era, then the "inflation" era and the classical space-time afterward (Figure 02-20). It has been shown that super-inflation can produce the kind of quantum fluctuations in the fabric of space-time for the formation of galaxies and clusters of galaxies later. The period of inflation is still required to resolve the horizon and flatness problems. 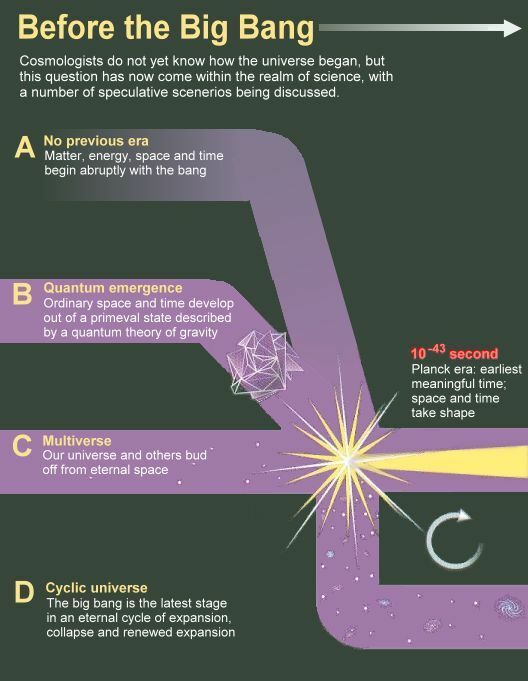 Since the repulsive dark energy has not been taken into consideration in the computation, it is not known if the pre-existing universe will really collapse as suggested in this model. 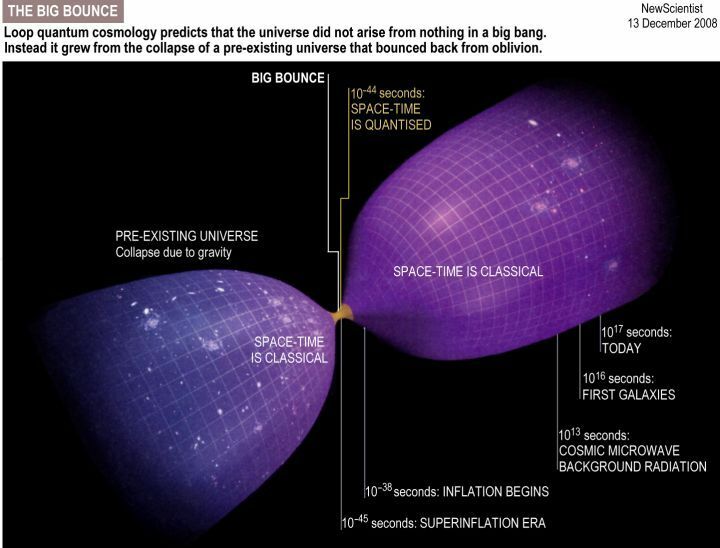 According to the cyclic universe model, the Big Bang is not the beginning of space or time. Instead, it is the moment when gravitational and other forms of energy are transformed into new matter and radiation and a new period of expansion and cooling begins. Hot, dense matter and radiation fills the universe immediately after the bang. The cosmic temperature reaches about 1027 oK. At this temperature, matter exists only in its elementary forms such as quarks, electrons, photons, and the like. However, the temperature remains modest compared to the 1032 oK or higher in the scenario for the usual Big Bang. During the following 9 billion years, the cosmos expands and cools. The elementary constituents clump into protons and neutrons, and eventually atoms, molecules, planet, stars, galaxies, clusters of galaxies, and superclusters. The blueprint had been laid down as tiny density variations (ripples) nearly the end of the previous cycle. Dark energy becomes dominant at this point. The repulsive nature of this substance causes the cosmic expansion to speed up as witnessed by present day astronomers. During the next trillion years, the accelerating expansion will continue and rapidly dilute the universe of the matter content and lumpy structures. The universe is restored to a simple, uniform, and pristine state, which is essentially similar to the prediction by the usual Big Bang theory. However in the cyclic universe model, dark energy is unstable. It will decay near the cycle's end into a form of extremely high-pressure energy that causes the universe to contract slowly. Space becomes increasingly smooth and flat as the contraction proceeds, while quantum effect produces random fluctuations seeding density variations over all the regions. The collision of the two branes produces another moment of Big Bang and starts another cycle. What went before the pre-big bang, before the pre-pre-big bang, ... ad infinitum -- There could be no beginning or end in a cyclic universe, which may exist forever. What is the 3 dimensional space expands into -- The usual explanation asserts that cosmic expansion is special, it doesn't expand into anything. Since the cyclic universe is a 3-D brane immersing in a 4-D space, the cosmic expansion in this model naturally expands into this 4-D bulk without invoking anything special. See also "Pre-Big Bang Universe". 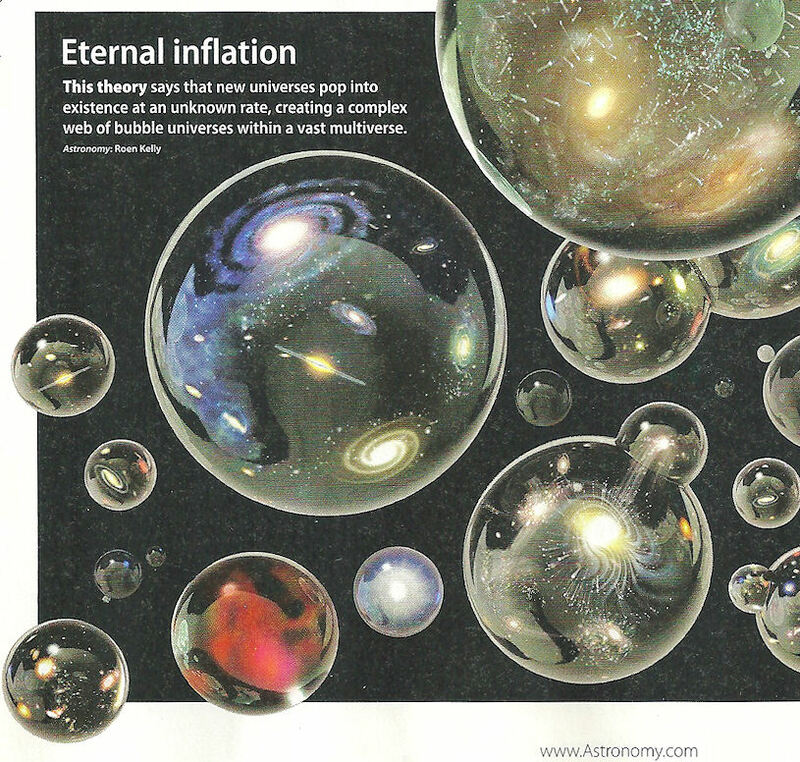 *** Multiverse (See "Multiverse, Eternal Inflation "). 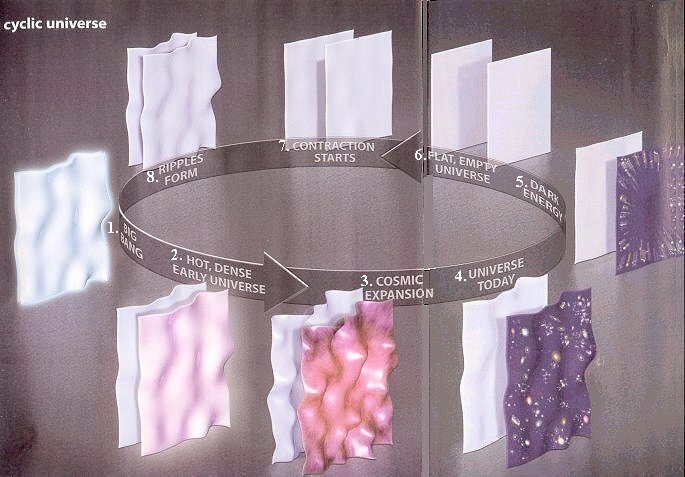 Figure 02-22 summarizes the various cosmic theories into four classes with some examples. Although the cyclic and inflationary theories explain equally well all the astronomical data, there are two tests that can distinguish them. Firstly, inflation in the usual Big Bang theory produces detectable gravitational waves. These wrinkle in space propagate through the universe and should produce a measurable polarization pattern in the CMBR. The gravitational waves in the cyclic model are far too weak to induce any change in the CMBR. Secondly, the inflationary picture predicts that the statistical distribution of temperature variations in CMBR should follow a bell curve, while the distribution has measurable deviation (from a bell curve) in the cyclic model. Observations in the next decade will be able to decide which one is correct. The first test may come very soon by ESA's Planck mission, scheduled for launch in 2009.